A global leader in the gaming monitor market, AOC, officially announces their first G2 Esports branded monitor – the G2590PX/G2. 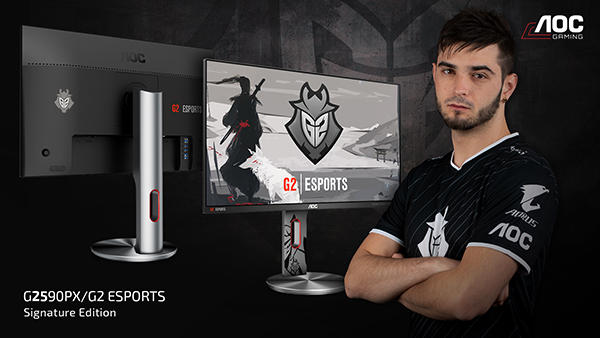 Made possible through a collaboration between AOC and G2 Esports, one of the most powerful and successful esports organisations worldwide, this monitor’s new special edition features a unique design with the official G2 Esports samurai art and logos. This 24,5” monitor will also be equipped with high performance gaming features such as 144Hz, 1ms response time and Free Sync. The G2 Esports Signature Edition is now available for retail at a price point of $419.00 / €369.00 / £329.00.